I think part of the reason why I feel such a completely different and a somewhat closer relationship with my birds than I do with my other pets is the fact that I'm so in awe of them! I feel so privileged to have these "wild" creatures love and trust me so completely! There is an air of mystery to them that I doubt we'll ever understand. Part of the attraction to them is (for me) the fact that I so desperately want to understand them... to be close, to be bonded, to spend a lot of time with them in order to try and figure out what makes them tick. When a dog or a cat exhibits a certain behavior, we can usually figure out why. The dog bit the kid next door because the kid was teasing him... etc. With cats, dogs and other pets, we expect our love for them to be returned without question. It's become commonplace. We understand them better and we don't have to work quite so hard to win their approval. Ah... but when a bird exhibits a certain behavior we have to discuss, analyze, consult, question, research and, in the end, more or less GUESS what caused that behavior. I think some of our experts in the field of parrot behavior have made tremendous progress in unraveling the mysteries of bird behavior, but I also believe they have only scratched the surface. I believe the same is true with parrot intelligence. Dr. Irene Pepperberg has been working with Alex what, over 20 years now? And she's still learning from him! Did she *teach* him to count, recognize colors and shapes, etc., or has she just tapped into a natural intelligence that is present in all parrots, but perhaps is beyond our comprehension? My, we still have such a very long ways to go!!! Will we ever get there? Health and dietary issues- still not fully understood. Parrot diseases- still not fully understood. Will we ever fully understand the avian mind? So we are fascinated and intrigued by the mysteries locked away inside these amazing feathered beings. We desperately want to earn their unconditional trust and love. Then, when we see that they do trust and love us, we feel humbled. A bond that defies explanation is created between bird and human. It's a bond... a closeness, a dedication, a love, that's almost spiritual in nature. Sometimes when one of my birds looks me straight in the eye, I get the overwhelming impression that they can see right into my very soul. It's hard to explain, but it always leaves me feeling a little shaken. Add to all of that the fact that these birds can actually communicate with us through speech... in our own language... and it's a bit easier to see why we suffer so much when that bond is broken through the loss of one of our birds. The loss of any pet is painful. Unfortunately, most of us have experienced it. Given the relatively short normal life spans of most animals, we can usually expect and accept the fact that we will have to endure the loss of one or more pets in our lifetime. When we lose a bird companion, whose life expectancy is thought to be closer to that of a human's, it's much more traumatic. Partly because of that spiritual bond that's been established and perhaps guilt that we somehow failed to understand our bird well enough to provide all that it needed to live out it's full life expectancy... simply because no matter how hard we tried, we still were never able to discover and understand the secrets and the mysteries of the avian psyche. When one of our birds is lost to us a part of our spirit is lost too. I came across this lovely poem "somewhere" on the Internet. I only wish I knew who wrote it so I could thank them personally for expressing such beautiful and comforting thoughts. "I'll lend you, for a little while, a bird of mine, He said. We'll brave the bitter grief that comes, and try to understand." 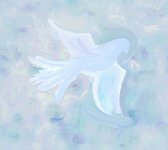 I have created this Book of Winged Memories as a special place for you to open your heart and share your memorial tribute to that special feathered friend who has been called away far too soon. My deepest heartfelt sympathies go out to you. It is my sincerest hope that this Book, in some small way, might bring you comfort in your grief. For you, my little angels, I still, and will always, grieve. You are no longer in my life, but you will forever rest peacefully in my heart. We'll all meet again at The Rainbows Bridge.